Will Smith is not the first action star to portray Robert Neville on the big screen. Charlton Heston's Omega Man is another memorable performance based on the same story by Richard Matheson. Matheson's novel is one of my favorites, original and unexpected. It is a modern apocalyptic classic, identifiably influential on any number of zombie and vampire stories. Anyone who has not read it should. 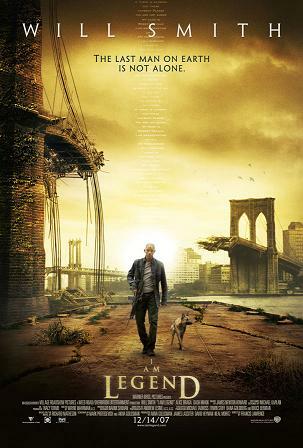 This version of I Am Legend differs from the book in a number of ways, including having an ending that reverses the circumstances of Neville's death. However, I think this version is both a faithful adaption of the source material, and in some ways superior to the original. Smith's Neville is a masterful study in loneliness. This is an element that is done well by each medium. Gaunt and haunted, Smith gives us a good sense of what it would feel like to be the last man on Earth. Always dancing on the edge of madness due to grief and isolation, Neville relies on his routines to sustain him. Fortunately, his obsession with finding a cure for the plague that swept man from the Earth is strong too. A bit of OCD seems to have some survival benefit. When Neville finally meets another human, he no longer knows how to interact with her. This is really where this version diverges from Matheson's. The crucial difference is hope. There was no room in the novel for hope, or providence, both of which figure in the original theatrical ending for I Am Legend. Another ending was filmed, but it performed poorly with test audiences. I can see why. The original ending attempted to combine Matheson's dark and subtle conclusion with a bright and happy Hollywood ending where everyone rides off into the sunset. That ending was terrible, and I'm glad they redid it. The theatrical ending is the happier, because in the Aristotelian sense, you cannot really say a life was a happy one until you see how it ends. In the alternate ending, Neville's whole life has been for naught. All his efforts, fruitless. All his suffering, pointless. Plus we get a lame version of the "monsters are people too, they are just misunderstood" trope. The way the vampire/zombies were handled in the novel made this seem like a good idea for the movie too, but their characterization in the movie is too feral to support this. By spending his life, Neville redeems himself from the brink of despair. The sappy alternate ending is not plausible because Neville no longer had any will to live. The providential arrival of another survivor allowed him an opportunity to die for something instead of nothing. Admittedly, the Legend tagline doesn't make near as much sense anymore, but the Job-like turn of this remake more than makes up for it.